The “Offset Gregorian” type antenna stands among 15 others that form part of the current configuration of the MeerKAT telescope. Photo: Sibusiso Biyela. TOP government officials bore witness to the launch of what is on its way to being the most powerful telescope in the world. The weekend saw the unveiling of 16 new antennas at the SKA site near Carnarvon with amazing science to boot. The MeerKAT team, in conjunction with the Department of Science and Technology, pulled out all the stops by inviting the press and top government officials to show their new toy. Over 90 km from the nearest small town of Carnarvon, the 16 new antennas stood in the winter, Karoo Sun. The Minister of Science and Technology, Naledi Pandor, is a staunch advocate for “Big Science” and the implications it has for South Africa. 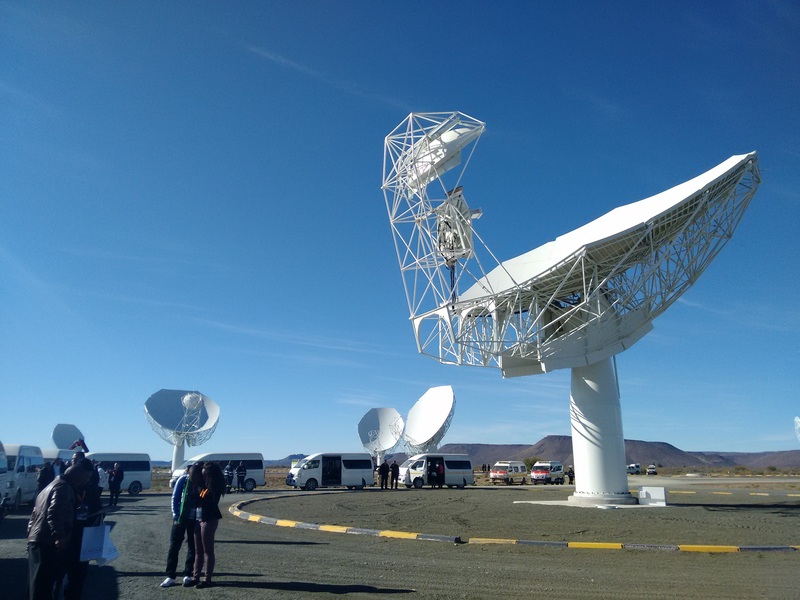 “Big science brings big opportunities and puts South Africa on the map,” said Pandor, standing underneath one of the towering antennas on the dusty site. “After this, the world can only expect the best from [South Africa],” she added, after a thrilling presentation by Dr Fernando Camilo, the lead scientist at the SKA. The First Light image from just 16 of the 64 antennas from MeerKAT shows a small patch of sky in unprecedented detail. 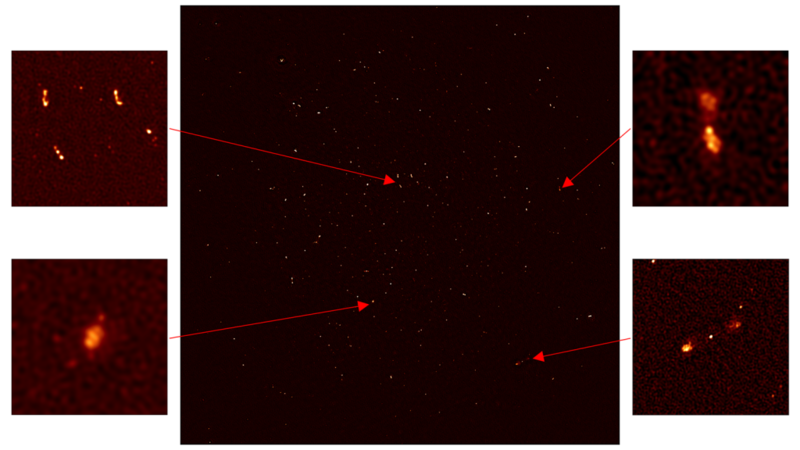 Camilo gave a moving presentation on the first image from the science already being conducted on the existing 16 antennas of the MeerKAT telescope. In a montage of radio images, Dr Camilo demonstrated the power of this telescope in its infancy. “We have shown than this radio telescope really is the best of its kind in the Southern Hemisphere,” he said. He likened the images from the telescope as putting on spectacles to better see the night sky in radio light. De Klerk has been a recipient of SKA bursaries since grade 11 and she has not disappointed, continuing with distinctions into her first year of her Bsc at the University of the Free State. “Where you are, is where you want to be, because you are the captain of your soul,” she said, singing nothing but praises for the SKA and its contribution to her community. The MeerKAT telescope is South Africa’s precursor to the Square Kilometre Array (SKA) project, which is set to be the world’s foremost scientific machine once construction is completed in the early 2020s. MeerKAT will be made of 64 antennas once completed at the end of 2016. This telescope, being a precursor to the SKA project, will be integrated into the larger radio telescope project at a later stage. Keep an eye out on scibraai.co.za as details on the science of the MeerKAT and the South Africans behind it emerge over the week.